BlockMaster Electronics, Inc. announces its line of Clear Connects™ push-in wire connectors, which offer a fast and easy alternative to traditional twist-on wire connectors, is now available for LED lighting applications. Installers and electricians will no longer have to twist 2, 3 or 4 wires together and try to jam them into a twist-on wire connector. The WPC300 Clear Connects Series will quickly and easily terminate wires. While BlockMaster's new WPC300 Series Clear Connects push-in wire connectors are suitable for electricians and installers working on residential, commercial, lighting retrofits or with prefabricated wiring systems, they are ideal for the very popular LED lighting systems being installed and retrofitted today. As the prices of LED lighting have dropped sharply over the last few years, there is a major push to replace fluorescent lighting in offices and factories with LED lighting. Many local utility companies are offering business incentives to convert over from fluorescent lighting to LED lighting. This past spring, BlockMaster Electronics took advantage of Commonwealth Edison’s incentive in Illinois, and converted about 100 fluorescent light fixtures in their office and warehouse over to LED lighting. The conversion is expected to pay for itself in less than one year. When the original fluorescent lighting fixtures were installed, the wires were connected with the old style twist-on wire connectors. The 21st century replacement for these old twist-on wire connectors is BlockMaster’s WPC300 Clear Connects with screwless connection technology. Clear Connects are easy to use and their transparency provides visual confirmation for a perfect connection every time. They also come with a Strip Guide so you know the proper length to strip your wire. The connectors accept solid and tinned stranded wire 22-12 AWG, and have a built-in slot for access to test the circuit. Lighting is not the only application for BlockMaster’s WPC300 Clear Connects. Other application includes security/alarm systems, appliances, heating elements, motor leads, junction boxes and control panels. Clear Connects are made with highly conductive copper. They are color-coded for easy identification and “touch-safe,” with wires safely shrouded by the connector housing. The WPC300 Series is safer and easier to use than traditional twist-on wire connectors. Installation time is greatly reduced, without having to twist or tape your connections. Their compact size enables connections in tight spaces. They are OSHA recommended to reduce wrist and hand strain. The new connector series has multiple international and domestic agency approvals, including UL and CUL. 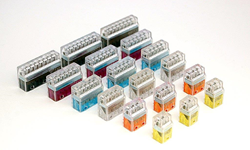 BlockMaster Electronics manufactures terminal blocks from 1 to 400 amps, including PCB styles up to 130 amps. The company offers over 9,500 P/Ns including PCB, Feed-through and Power Distribution types. BlockMaster’s Value-added Center can also provide quick turn around on prototypes.